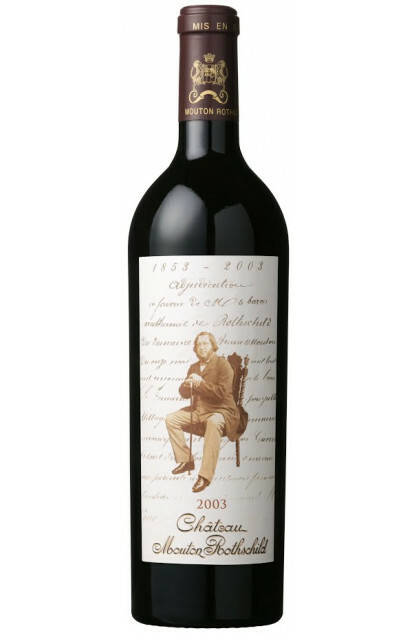 It was in 1853 that Baron Nathaniel de Rothschild bought Château Brane-Mouton, to which he immediately gave the name Château Mouton-Rothschild located on Pauillac territories. After being second on the 1855 prestigious list, it became Premier Grand Cru in 1973, and thus part of a limited list since there are only 5 Premiers Grands Crus : Château Lafite-Rothschild, Château Latour, Château Mouton-Rothschild all three Pauillac, Château Margaux, the only Margaux, Haut-Brion, the only Graves until 1986 and since then, Pessac-Léognan. The vineyard spreads on around 80 hectares planted in varieties typical from the Medoc and Haut-Medoc regions : Château Lafite-Rothschild, Château Latour, Château Mouton-Rothschild tous les trois Pauillac, Château Margaux, seul Margaux, Haut-Brion, tout seul, Graves jusqu'en 1986 et depuis, Pessac-Léognan. The whole harvest is done by hand and 100% is put in new barrels every year for 19 to 22 months before being bottled. The annual production amounts to 200.000 barrels which is 240.000 bottles, an average yield per hectare of 2.200 to 2.300 litres.